A great capacity of creation and attention to detail inherited from a long tradition make SCAB Design a symbol of Italian production. Extraordinary objects, which take shape from the principles of beauty and functionality and transform into CHAIRS, BARSTOOLS and TABLES. The objects that inhabit our lives truly reflect us and relate our experiences through shape. 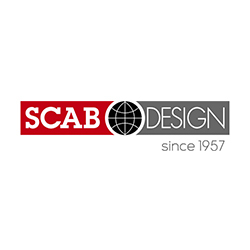 SCAB Design has been creating these objects for 60 years, conceiving them as they will be in your hands and modelling them so that they can be used every day. Working with technopolymer materials with a pioneering spirit since the 1970s, finding innovative solutions ahead of the times, the results are of extremely high quality. Quality is conceived to construct objects that are not only aesthetically remarkable but essential in their daily use. A team of specialized architects, designers, engineers and consultants follows every single product in the entire production cycle with a spirit of craftsmanship in large-scale production.